This Genuine bicycle lift is an excellent solution for creating more floor space in your home garage! 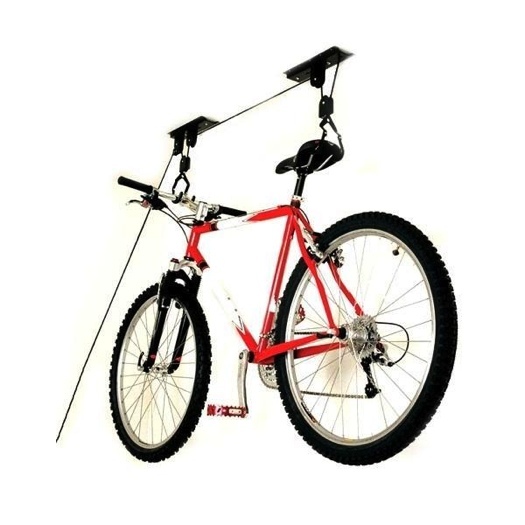 Simply attach the hooks to your bike, lift and lock. Attach the rubber coated hooks to the seat and handle bar (the coating protects your bike from scratches). Each lift uses a pulley system to allow easy lifting of bicycles weighing up to 50 lbs. With it extra long rope, you can mount the lift up to 12 feet high. Once you easily raise the bicycle to the desired height, lock and tie off the rope onto the included cleat. For safety purposes, there is an accidental release locking mechanism. Each easily mounts onto your ceiling joist by itself or pre-mount to a standard 2x4 board and then attach it to the ceiling (directions for both methods are included).